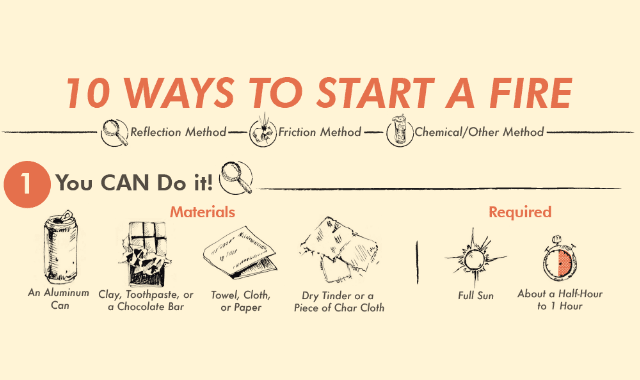 10 Ways to Start a Fire Without Matches #Infographic ~ Visualistan '+g+"
Creating fire is one of the earliest forms of engineering. Imagine all of the trial and error that went into getting that first spark to form? Fire may be the most fascinating of the four elements as it needs friction and effort from outside forces to become the all-consuming and powerful force that it’s known as. In today’s world creating fire is as simple as pushing a button, but what happens when you no longer have that lighter or those matches that are needed to create this important element? Never fear, here are ten tried and true methods from AlansFactoryOutlet.com that can get that flame to ignite without a single match. Many of the items needed to attempt these can be found right in your home or backyard. Some household items that you’d never guess could be used to create fire include a sandwich bag, a knife, a gum wrapper, a shoelace, and even the battery from your mobile phone can be used. Give in to your inner boyscout and give these methods explained by Alan's Factory Outlet a try on your next camping trip!